Beyoncé and Jay-Z‘s 6-year-old daughter Blue Ivy Carter bids $19K for a painting at an auction. Beyoncé and JAY-Z’s daughter Blu Ivy Carter is already an internet sensation, thanks to her sassy behaviour. 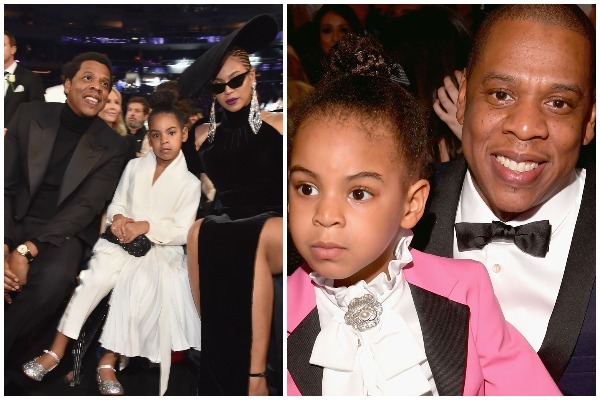 Remember two months back, the video of Blue Ivy Carter was shushing her parents at 2018 Grammy Awards which was captured on camera and went viral on social media. The video of Blue Ivy Carter is once again stirring up on the social media and this time it’s a BIG deal. The Carter family attended the Wearable Art Gala in Los Angeles and Blue Ivy Carter stole the moment at event. The clip of Blue Ivy Carter bidding for $19k on a piece of paint at art auction is going viral where Jay Z had to literally stop his daughter from bidding. The event was organised by Beyoncé’s mom Tina Knowles and her husband Richard Lawson. Blu Ivy initially bid $17,000 for an acrylic painting work and went higher bidding at $19,000. The video of Jay Z jokingly stopping his daughter from bidding and trying take away her paddle is going viral. However, Tyler Perry made a winning bid for $20,000. Normal human: oops my child just burped up some milk. However, Blue Ivy didn’t go home empty hand and spent thousand of dollars bidding on a 36″ x 36″ piece of art for $10,000. Previous : From Yellow To Purple To Metallic, Actress Priyanka Chopra Gives Us Serious Fashion Goals!